With 16 weeks to go, you can revolutionise your life. 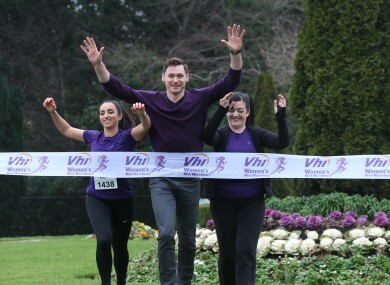 David Gillick with fellow Vhi experts Louise Heraghty and Maeve Higgins. THERE ARE MANY different reasons why people choose to take part in the Vhi Women’s Mini Marathon. For some it’s a serious race they’re aiming to win. For others it’s a chance to raise cash for charity. For many more though, it’s a chance to make a complete lifestyle change. That’s the view of two time European indoor 400m champion David Gillick who has signed up with the sponsors to provide expert nutritional advice to all the participants in this year’s race. MasterChef winner Gillick will combine his love of cookery with his athletics expertise to provide healthy eating plans and recipes for the 16 weeks leading up to the event. This will involve the 31-year old preparing sample meal planners and sharing his favourite recipes to support women all over the country with their training. “Without a shadow of a doubt you could have a complete lifestyle change,” Gillick told The42.ie during the week. ”You can do so much over the course of 16 weeks and not only from a wellness point of view. “Training for an event like this can have an impact on all areas of your life, it really can revolutionise your entire life. While Gillick’s role is primarily to give nutritional advice, he also believes that those taking part in this year’s race should do their best to train alongside other competitors as it may provide that extra bit of motivation needed. “I’d always say to people if you can get in with a group, get buddied up with someone in the same boat as yourself, someone with the same mindset, then training won’t feel like such a task. Gillick, alongside fitness enthusiast and DJ Louise Heraghty, the Vhi’s Dr Ui May Tan and one of Ireland’s most popular comedians Maeve Higgins will give advice to participants on the sponsors dedicated app – available on android and iOS – something the former sprinter is very excited about. “The app contains training plans and tips as well as nutritional advice from breakfast right through lunch and dinner. For me, it’s important that we educate people and not just talk at them. “It also gives a few tips on nerves, dealing with injury, and general motivational advice. Email “'The mini marathon can help you make a complete lifestyle change'”. Feedback on “'The mini marathon can help you make a complete lifestyle change'”.